Map of the Imperial Circle of Austria of the Holy Roman Empire. Partie Meridionale du Cercle d'Autriche, qui comprend la basse partie du Duche de Stirie, le Duche de Carinthie, divise en haute et basse; le Duche de Carniole, divise en haute, basse, moyenne et intere. Carniole, et l'Istrie Imperiale. 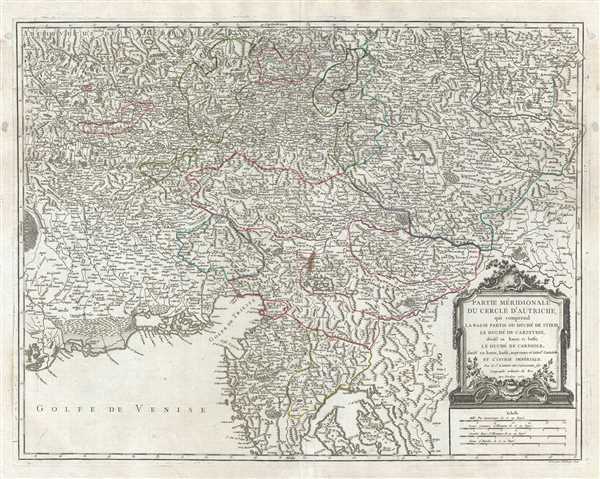 This is a fine 1752 map of southern Austria and Slovenia by Robert de Vaugondy. It covers from Caorle in Venice, Italy east as far as Varazdin, Croatia and from Graz south as far as Segna in Croatia. Includes the modern day countries of Slovenia along with parts of Austria, Italy and Croatia. The entire region is depicted in extraordinary detailed, offering both topographical and political information, with forests and mountains beautifully rendered in profile. The 'circle' in the map's title refers to an 'imperial circle,' one of the administrative units created primarily for tax and defense purposes by the Holy Roman Empire. The Napoleonic Wars would, of course, dissolve the Holy Roman Empire and lead to the consolidation of Germany in 1871, with a separate Austria. Very good. Minor wear and verso repair along original centerfold. Original platemark visible. Some spotting near center of map and along borders. Rumsey 3353.066. Pedley, Mary Sponberg Belle et Utile: The Work of the Robert de Vaugondy Family of Mapmakers, 278, state 1.